(CNN) -- Three prisoners -- including one considered to be among Belgium's most dangerous criminals -- have broken out of a prison near Bruges in a daring helicopter escape. 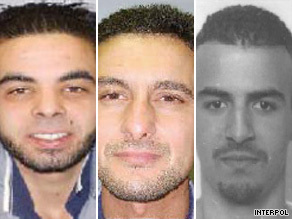 Mohammed Johry, Abdel Had Kahjary Mulloul and Ashraf Sekkaki escaped a Belgium prison. Thursday's jailbreak prompted Interpol to issue an international alert to police around the world to be on the lookout for the men. Accomplices of the three inmates hijacked a helicopter and forced the pilot to land in the prison courtyard, Interpol said. The fugitives are Mohammed Johry, Abdel Had Kahjary Mulloul and Ashraf Sekkaki. Sekkaki is considered one of Belgium's most dangerous criminals, Interpol said, with more than 16 convictions for violence, including bank robbery and kidnapping. A 22-year-old man of Moroccan origin was an accomplice to the group but had to stay behind because the helicopter couldn't carry everyone, the Belga news agency reported. Jailbreaks by helicopter are becoming "far too common" worldwide, Interpol Secretary-General Ronald Noble said. That highlights the need for countries to report the identity of escapees as quickly as possible, he said. "It is vital that police have the information they need to locate, identify and arrest these fugitives," he said. Belga identified the helicopter pilot as Ludwig Louwagie and said he was unhurt. "It was just like in a film," Louwagie told the news agency. He said a couple had booked a sightseeing tour of the Bruges region Thursday afternoon. While in flight, the man suddenly pressed a weapon against his temple, Louwagie told Belga. The man took away his headset so the pilot couldn't talk to ground control and forced Louwagie to land in the prison courtyard, he said. "I tried to land next to the prison, but the weapon was still pressed hard against my temple," he said. "I had no choice."